Dental braces are used for the purpose of correcting jaw or teeth alignment problems such is the bad bite, crowded teeth or disproportion between teeth and jaws. Dental braces are not only reserved for children and adolescents as assumed, but they can be used by people of all ages in order to achieve the above-mentioned corrections of the teeth and jaw. Today, there are many types of dental braces some of which are very discreet or even invisible, so the patient can choose the one that suits him the best. Traditional dental braces are usually referring to the metal brackets that are attached to the outer part of the tooth and that are interconnected by an arch wire that actually conducts tooth movement. This type of dental braces is still the most commonly used because it is affordable, efficient and very grateful. The same braces are available in a version with ceramic brackets that are tooth-colored so they are very discreet, especially if you choose the O-rings in a similar color. Another variation of these braces are self-ligating braces whose brackets are smaller and do not need the O-rings, as an arch wire is attached to the bracket with the unique “sliding door” system. In this way it reduces friction and so allows free movement of the teeth with mild force. The treatment is significantly shorter, and patient comfort is enhanced. Traditional dental braces can in some cases be placed on the inside of the tooth and thus they are invisible. Such braces are called the lingual braces and they are designed for smaller corrections. Although very popular, these braces make the oral hygiene difficult to maintain and can be very uncomfortable. Another type of “invisible” dental braces is Invisalign. This orthodontic treatment consist in making personalized transparent aligners upon the X ray and images of the patient, that he will change every 2 or 3 weeks as the teeth are moving. 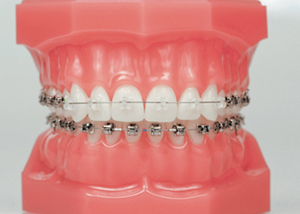 This type of braces is also suitable only for smaller corrections and it is easy to maintain as it can be removed.